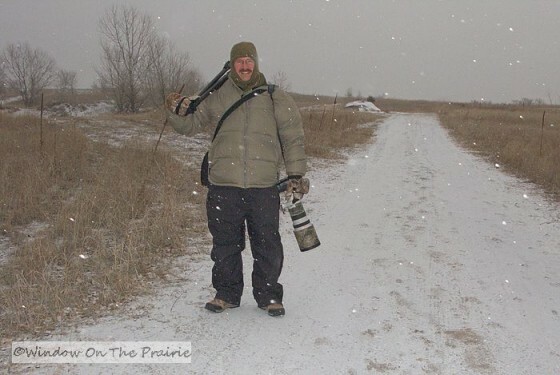 Harland and I awoke at 4am Monday morning, dressed in 52 layers of clothing, gathered our photography gear together, and headed to the blind we had rented overlooking the Platte River in Nebraska. We arrived in the pre-dawn darkness, hauled our equipment to the blind, set it up, and waited for daylight. It was about 20 degrees with a north wind and it was snowing. 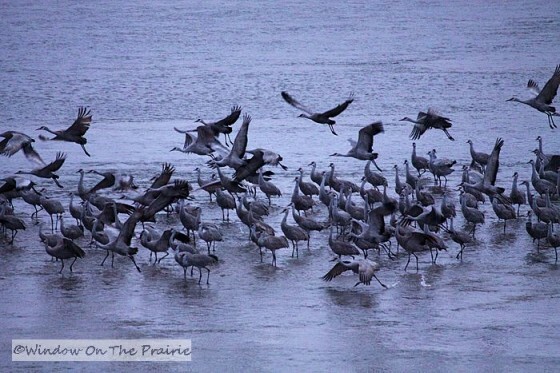 We could hear the raucous calls of the Sandhill cranes in the darkness roosting down on the river in front of us. Finally a gray dawn revealed their huddled bodies standing in groups. Most of them were still sleeping with their heads tucked under their wings. A few were awake, and as the light grew they began to “dance”, hopping up and down anxious to get out into the surrounding fields to feed. 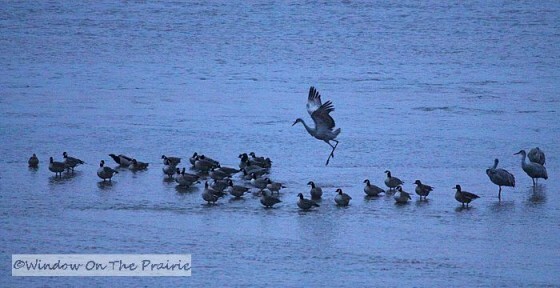 Here a lone crane dances while a flock of Canada Geese looks on. Finally they began to take off. First they left in large groups, and then in smaller groups, pairs or singles. The bad weather was keeping them in. On sunny days the entire flock leaves all at once. But that morning, many of them were content to sleep in, heads tucked under wings. As the hours passed, we continued to watch as here and there a few left to go feed. Some of them got a running start before they took off. Finally, when we were chilled through and shivering, we left the blind to go get warm and eat breakfast. But before that, I took this long shot of the river. You can just make out the cranes in the center of the river as black dots. All the pics above I took with a 300mm lens I borrowed from Harland. I also took this video. 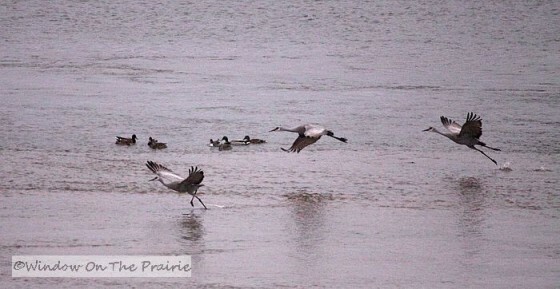 My video camera can’t zoom in close to see the birds in detail as we were about a quarter mile away from them, but I wanted you to be able to see the river and hear the cranes’ raucous calls. And here’s what we looked like as we left the blind. Not a pretty sight I know. But I won’t be making fun of Harland’s Stay-Puf Marshmallowman (remember Ghostbusters?) coat anymore. I want one of my own. He didn’t get as cold as I did. As we drove out we stopped to watch the cranes feeding in the fields. 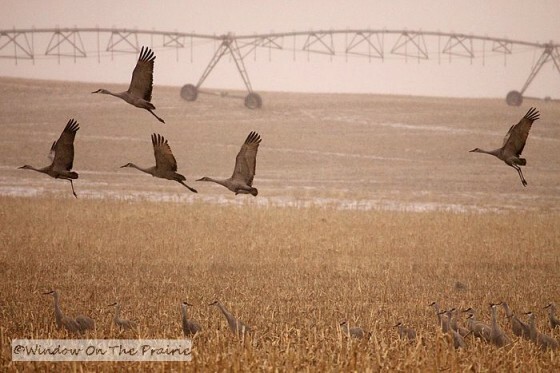 They fly from field to field searching for waste grain, primarily corn. As I was taking pics of the cranes from our truck, I looked down and saw these guys sitting tight waiting out the nasty weather. 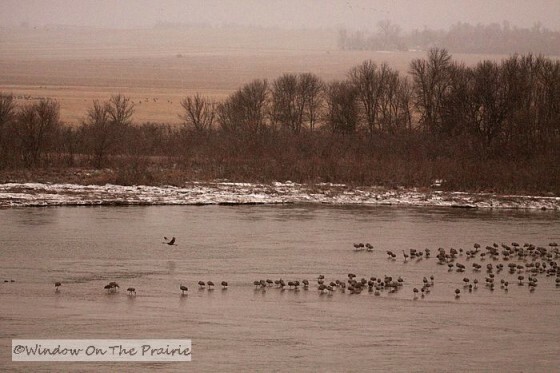 Canada Geese aren’t as skittish as the Sandhills. These were sitting right near us. We headed back to town, peeled off some layers so we looked halfway human again, and had a nice warm breakfast. 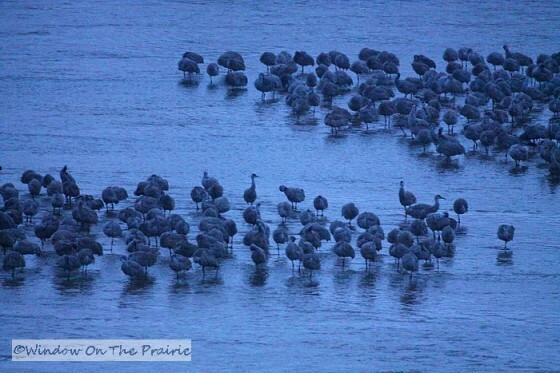 We’re already planning next years’ trip up to Nebraska to see the cranes. We’re going to try to get a blind closer to the river, and either buy or rent a longer lens. 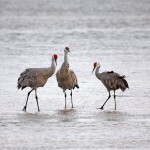 I was using a 300mm, but something longer is required to adequately capture the rustic beauty of the Sandhill cranes. 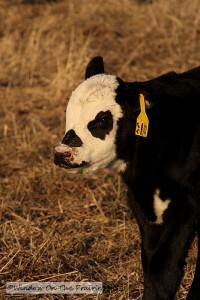 ———> UP NEXT: A visit from a week old white faced calf. He comes in close to check me out. Bless you for braving the weather to get such great pictures. I love the video and the noise they make and you don’t realize the size of them truly until you see them next to the geese.Nice shots. Thank you so much and as always Harland too. I always enjoy your adventures! Thanks for sharing. I’ve always wanted to do that! But my window of opportunity may have passed, I’m no longer as hardy as I used to be. That warm breakfast would have called to me a lot earlier than it did to you. Thank you so much for sharing this experience. You’re quite welcome Another Sue. I’m so glad to be able to share this with all of you. Oh, brrrrrrrrrrrrrrrrrrrrrrrr!!!!!!! I’d love to see those cranes but would have to get a whole new doughboy wardrobe to stay warm out in those temperatures!! Maybe one of these days. 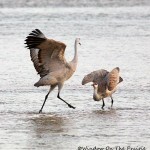 I did get to see sandhills a few weeks ago at Wheeler NWR up in north Alabama. They sure can make a racket!! I wholeheartedly second Tina’s comment! (from Amsterdam, NL). 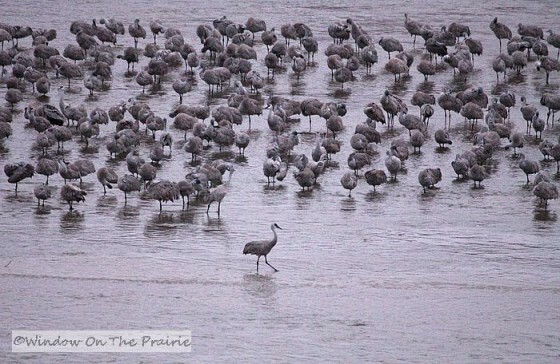 I’m so glad you took my suggestion and came to our area to see the Sandhill cranes! 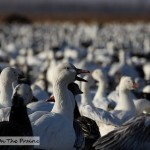 It is so awesome to see and hear the great flocks take off and soar! I was surprised when I saw that you were that far from the cranes in your blind. 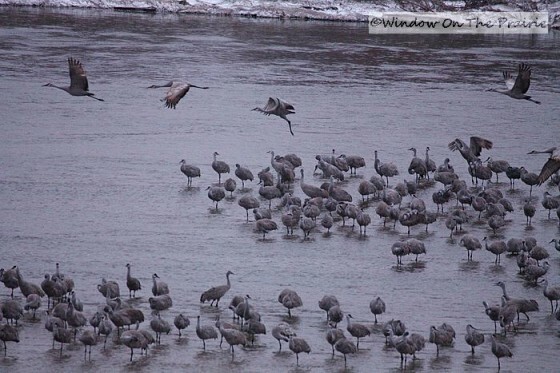 When I went on a commercial tour, the cranes were no more than 20′ in front of our blind when the sun came up! What a surprise that was! I would guess that is the way it would be at Nebraska Nature & Visitor Center at the Alda Exit on I-80 or at Rowe Sanctuary at the Gibbon exit, where they have special photo blinds nearer the river. Or maybe that was where you were? They also both present a program, which is very interesting. I’m glad you got the first experience under your belt and will be able to make adaptations next year. Yes! Bring your warmest clothes–several layers! 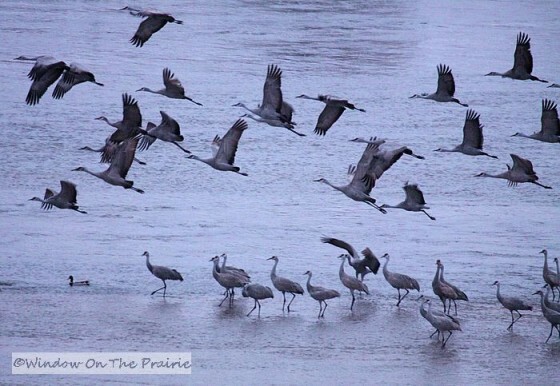 Once you see the cranes, it is hard to stay away from then on! 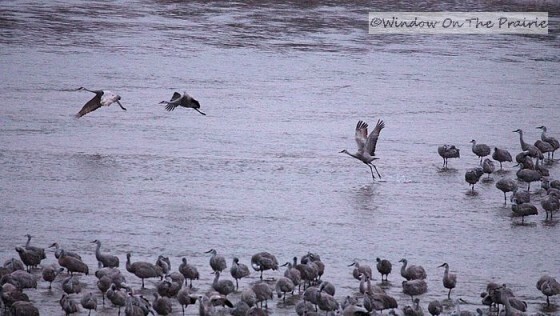 Also, the later it gets in the year, and the more the corn is eaten up, the cranes get braver and have to fly further south of the river. 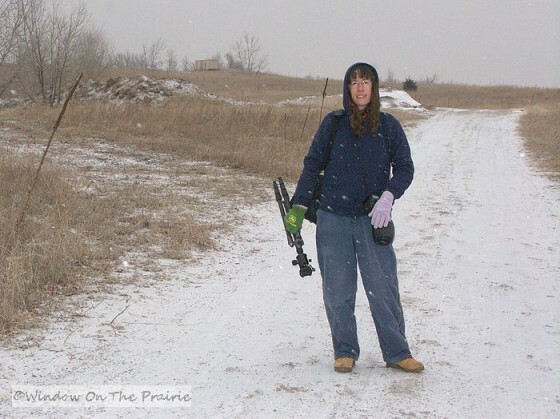 They stand rather close to Highway 281 within the 10 miles south of I-80 by April, when the corn is getting scarce. So you might be able to get closer then, also. Looking forward to seeing another report next year, really enjoyed your photos and info from this year’s trip! Thank you for encouraging us to come up for a visit. We had so much fun and will definitely be coming back next year. The blind was at the Nature and Visitor ctr. We were rather disappointed with how far away it was from the birds. Next year we will reserve one of the camera blinds on the river at Rowe’s. Can’t wait. We’re also considering coming back up in the next couple weeks to visit the blinds at the Buffalo Bill Ranch historic site. Have you had any experience there or heard of anyone going there? 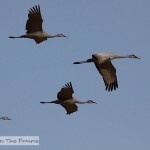 We had sandhills fly over our house this fall (Nov.). I love their sound. Thank you for recording them so I could reminisce(sp?). I really love the second to the last photo! It’s so vintage looking! Sounds like a great adventure heading out there in the wee hours of the morning…I love it! I’m glad you took video. I loved hearing what they sound like! That was awesome! Glad you enjoyed the vid Bonnie! . Will hopefully have a better video camera next year so I can get in close shots on video. Doesn’t look like a fun day for taking pictures, but I do think your shots turned out quite well. Great adventure! Thanks Teresa! Luckily the blind got us out of the wind anyway. You all really do have some adventures! Thank you for sharing them with us. I especially enjoyed the video, the sounds were so cool(no pun intended). Next year don’t forget to wear a puffy suit like Harlands. Thanks Chester’s Mom. I’m going to wear everything I own next year, including that coat. 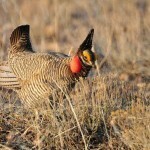 Great post and wonderful pictures, love the video it really puts you there! Hi Pam, I’ve heard of that trainyard and would love to see it. Thanks for all the info. You’re the very fount of information.